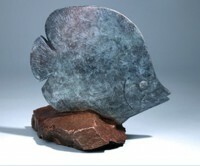 Catherine Ferrell’s sculpture is found in museums and collections, both nationally and internationally. Her studio in Vero Beach, Florida faces the Atlantic Ocean giving her inspiration and subject matter generously. She has been a US Coast Guard licensed captain and has recently returned from expeditions to the Sea of Cortez, in preparation for a museum show in 2013 and from The Andaman Sea and Mekong, researching new work for 2014. Catherine’s work ranges in scale from smaller indoor pieces as large as 8’x 6′ x 10′. Collections include: Bennex International, Norway, Norton Museum of Art, Cornell Museum of Art, United World College, The Brevard Art Museum, and Brookgreen Sculpture Garden. Her sculpture has been part of the 13th, 14th, and 15th American Society of Marine Artists National Exhibitions where Catherine is a Signature Member. Solo shows include: The Cornell Museum of Art 2010-2011; Gallery 14, Vero Beach, FL, 2009; Cheryl Newby Gallery, Pawley’s Island, SC, 2003; the Master’s Gallery, 2007 and Pen and Brush, Inc., NY, 2002. Her work is represented by Cheryl Newby Gallery, Pawley’s Island, SC and Art of the Sea Gallery, South Thomaston, ME. Cathy is a member of The Salmagundi Club, GOGAP, Audubon Artists, Society of Animal Artists, Fellow in the American Artist’s Professional League and Catharine Lorillard Wolfe Art Club. She was featured in Notes from Brush Hill, The ASMA Journal, (Summer 2011) and her work is focused in The Art of Joy catalog from Cornell, 2010-11.